People still make a mistake while making investments for kitchen. You know what? Purchasing every single utensil separately. Instead, if you get a cookware set, you can have all you need in one package, that too at a reduced cost. 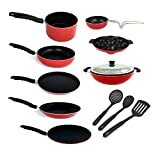 A cooking set has many items such as frying pan, kadhai, cooking pan, sauce pan, etc. that are enough to serve your daily purpose. Kumaka non-stick cookware surface is enhanced with a non-stick coating on a base material such as aluminium which keeps the food from sticking to the cookware while cooking it completely. 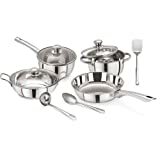 Cookware sets have many different cooking dishes that you can use according to your needs in the kitchen. You can use the frying pan for frying, large pots for boiling rice or making spices; small sized pans can be used for making tea or boiling milk. So, you can do anything and everything with a cookware set. You just need to pick the right set of the appropriate size required for your family. 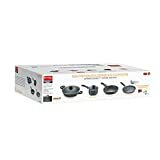 You can try Prestige and Pigeon to get trusted and durable cookware sets. Customer Care – after sales service of Prestige is horrible. First they are reluctant to even record your complaint. Customer Care aptitude is grossly missing as a culture in Prestige. First, the dealer from where you bought would ask you to go to customer care x km away. After you insist even if they receive the product related to complaint, they will send it to customer care in their sweet will. Then customer care will refute your complaint, play defensive and harass you so that you forget about your complaint. Ultimately you will feel it was not worth it. You haven’t mentioned Vinod cookware…especially their platinum range is great. I bought pressure cooker Nakshatra Alpha SS Pressure cooker 5 Litre from Big Bazar , Amritsar Punjab . This pressure cooker is really a crap. In 5-6 Vissel it burn the food . I tried on low , medium and high flames but at end result is same. Even if I am cooking Kidney beans, chickpeas with lot of water, it burned in 5-6 vissel. Its first time in my life I bought any product of prestige and I am extremely unhappy and dissatisfied from poor quality. Every night I am serving burned food to my family. Now my trouble is this I am living in Australia and Can’t change it anywhere. Moreover as per market reviews PRESTIGE is good brand and I trusted on it , and haven’t kept the bill.